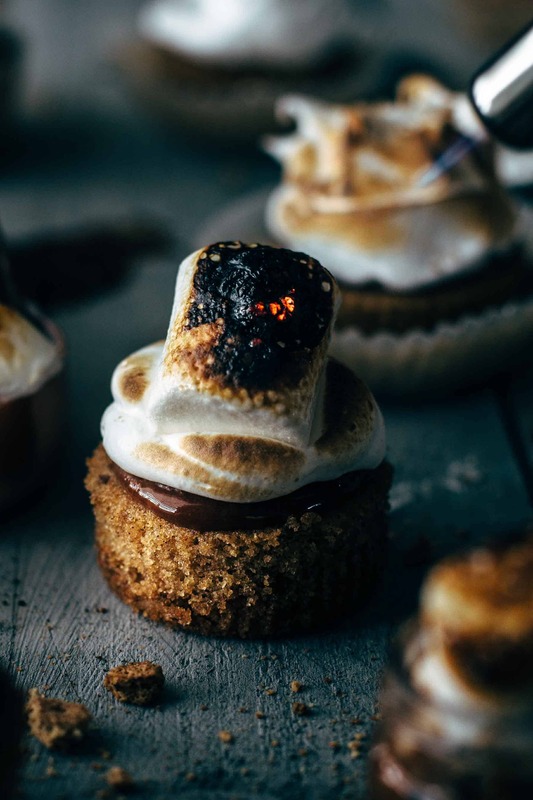 With this S’mores Cupcakes recipe, campfire feeling is guaranteed. Soft graham cracker cupcakes with a crunchy graham cracker crust, topped with delicious chocolate ganache, and fluffy marshmallow frosting. With video! Sitting around a fire on a mild summer night is something magical. I love to sit in front of the fire and alternately to stare into the fire and into the sky. Chatting, laughing, and singing with your friends, and enjoy the night. There are too little nights like this. I would love to have more time to do that more often. It brings you down to earth and slows you down. Forget the smartphone, forget the TV. Just you and nature. What is THE campfire treat? Right, s’mores! I’m a sucker for s’mores. That toasted, warm, and gooey marshmallow between chocolate bars and graham crackers is so delicious. I love to play around with it and squeeze it that the marshmallow oozes out and all over my fingers. It seems that I’ll never grow up in some ways. Because such campfire situations happen too seldom in my life, I need to bring campfire feeling to my home. 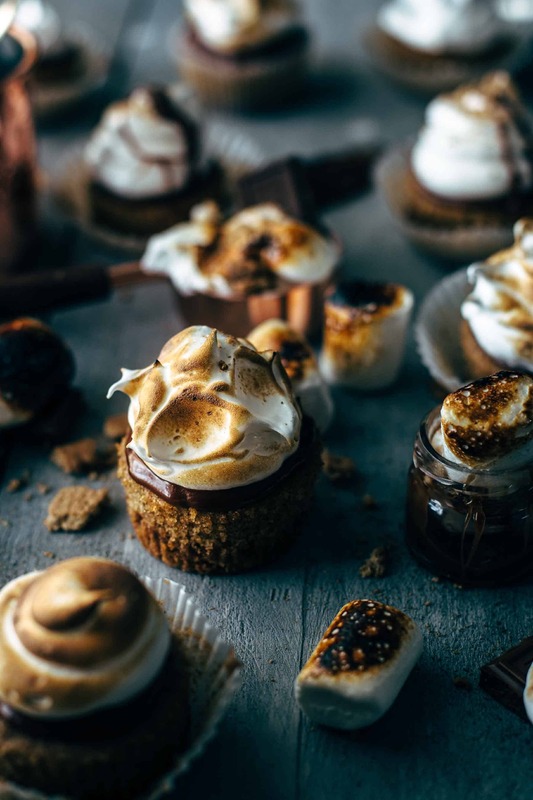 This S’mores Cupcakes recipe is the best way to do so. For the graham cracker cupcakes, I used this S’mores Cake recipe as a starting point. I decided to replace a part of the flour with finely crushed graham cracker crumbs to get graham cracker taste into my cupcakes. The graham cracker cupcakes are soft, moist, and have a great flavor. They fit perfectly to the chocolate ganache and the marshmallow frosting. 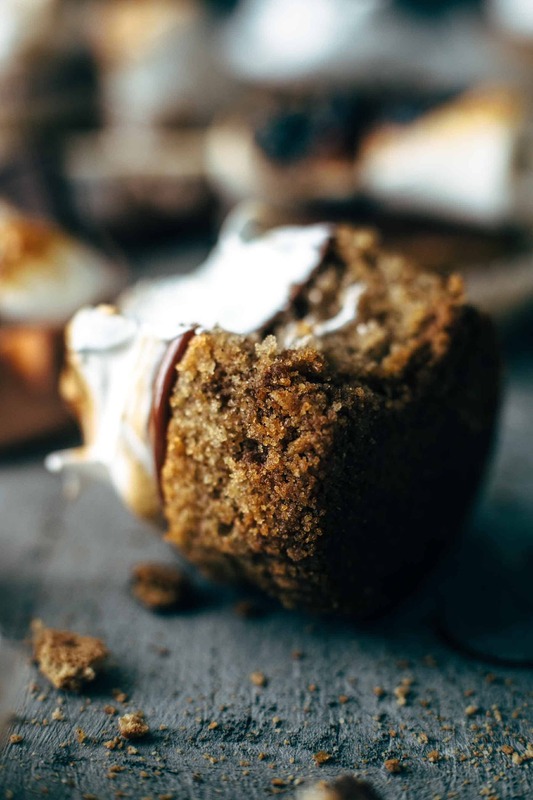 For me, authentic S’mores Cupcakes need to have a graham cracker batter. The marshmallow is gooey – like the frosting of this cupcakes. The chocolate is tenderly melting – like the chocolate ganache of this cupcakes. So 2 parts out of 3 are very authentic and close to real campfire s’mores. Then we need graham crackers. Ok, cupcakes are not crunchy like graham crackers. This is a fact. But I wanted to have a little crunch in the cupcakes, so I added a graham cracker crust as a bottom of the cupcakes. 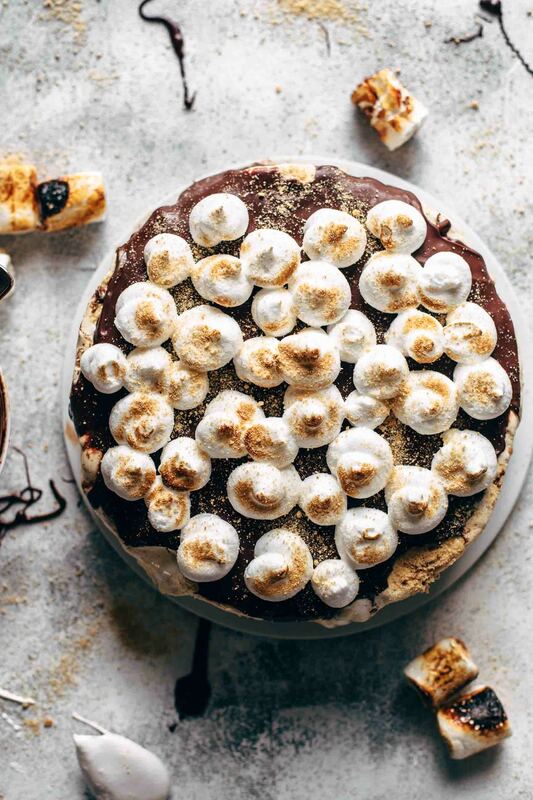 That graham cracker crust is the key and the 3rd important part to a very authentic s’mores experience. I can honestly say, that I’ve never had more authentic S’mores Cupcakes before. I recommend making the chocolate ganache in the beginning and let it stay until you start frosting the cupcakes. When it is too warm, it is too thin and would run down the cupcakes. Spoon the cooled chocolate ganache on top of the cooled cupcakes. If the chocolate ganache is not smooth anymore, reheat it in the microwave for a few seconds. Because the chocolate ganache is made of chocolate bars and whipping cream, it tastes like pure chocolate bars but creamy. Go with the brand you love, but for me, nothing can compete with Hershey’s milk chocolate bars. This is THE s’mores chocolate for me. I don’t know how about you. But #1 is my absolute favorite. If you are not in the mood for making the frosting, then #3 seems to be the best alternative. 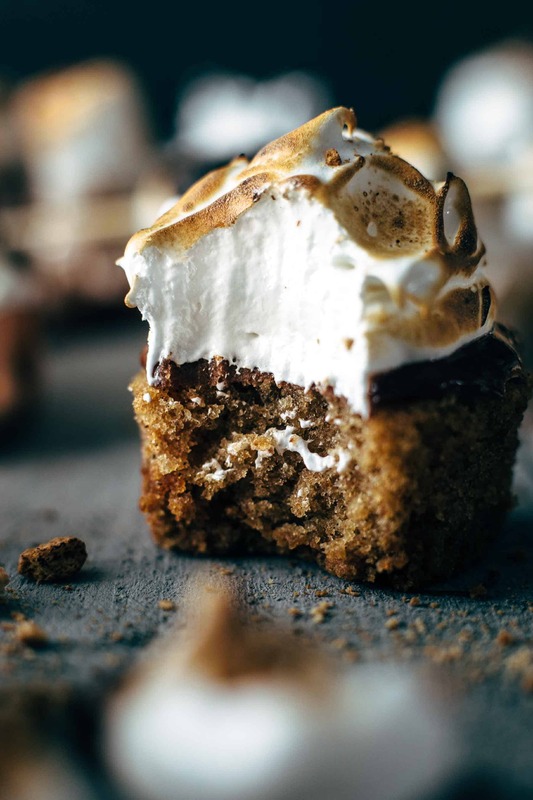 The marshmallow meringue frosting can be toasted with a kitchen torch like marshmallows. Using store-bought marshmallow cream would be super delicious as well, but the consistency is not the best for frosting cupcakes. We all love marshmallow cream, and we all do know that it is super gooey. It wouldn’t stay on top of your cupcakes. It would run down the sides. To make marshmallow meringue frosting on your own is not that hard as you might think. You don’t do much more than whisking, and mixing, and mixing, and mixing until the meringue is stiff and glossy. Because the egg whites are warmed, you don’t need to be worried about salmonella, and the frosting won’t weep either. Does anyone have any recommendations on a guitar-playing-crash course? Seriously. 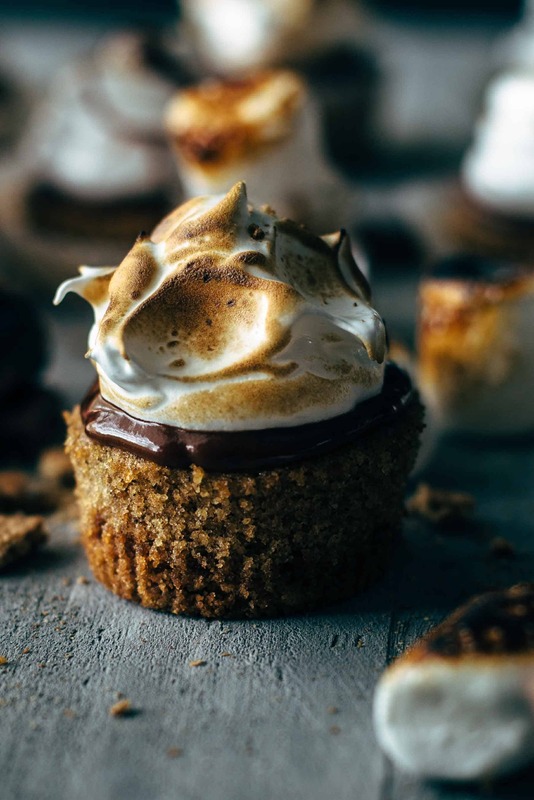 If you make this best S’mores Cupcakes recipe, leave a comment, rate it and tag a photo #alsothecrumbsplease on Instagram! Would love to see your snap! 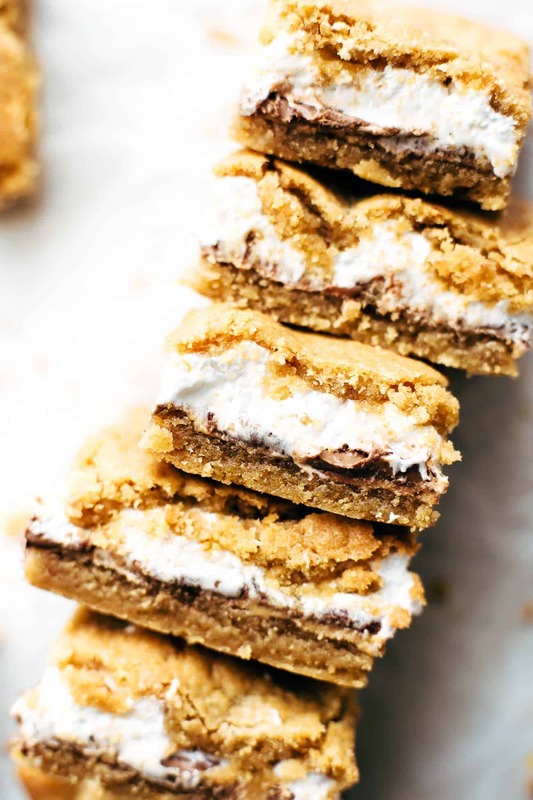 You may also like Peanut Butter S’mores Ice Cream Cake, Best S’mores Cookie Bars, Best ever S’mores Cookies, Unbelievably delicious S’mores Cake or click here to see all recipes. Preheat oven to 350°F / 175°C. 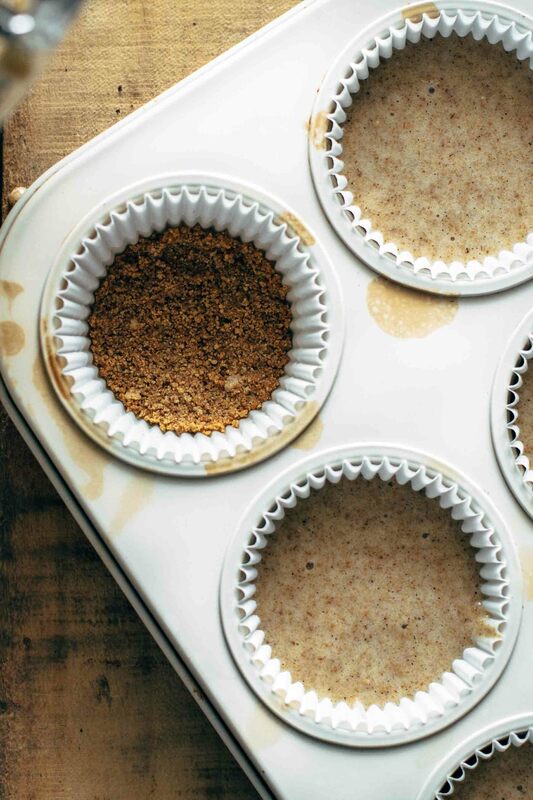 Line two 12-cup muffin pans with cupcake liners (this recipe yields about 16 cupcakes). Set aside. Make the chocolate ganache: Place chopped chocolate in a heatproof bowl. Set aside. Heat heavy cream in the microwave for about 1 minute or until very hot and almost boiling. Pour over chocolate. Stir until chocolate is completely melted and combined. If chocolate doesn't melt completely, then put the bowl into the microwave a few seconds. Set aside until you start frosting the cupcakes. Make the graham cracker crust: In a small bowl combine graham cracker crumbs, butter, and sugar until evenly moist. Press into the bottoms of your cupcake liners. Bake for 5 minutes until the tops are set. Set aside. Make the graham cracker cupcakes: In a medium-sized bowl, stir graham cracker crumbs, flour, baking powder, and salt to combine. Set aside. In a large mixing bowl, using a handheld or stand mixer fitted with a whisk or paddle attachment beat egg and sugar on medium speed until creamy and combined for about 2 minutes. Add oil and vanilla* and mix on low speed until combined. Alternately add dry ingredients and buttermilk to the batter and mix on low speed just until combined. Begin and end with dry ingredients. Spoon batter with an ice cream scoop into the cupcake liners on top of the baked graham cracker crust and fill 2/3 that your cupcakes don't sink or spill over the sides. Bake for about 17-20 minutes or until a toothpick centered in the middle comes out clean. I baked mine for 18 minutes. Let cool to room temperature before frosting. Make the marshmallow meringue: Fill a saucepan 2 inches high with water and bring to a simmer over medium-low heat. Place egg whites, sugar, and cream of tartar in a heatproof bowl (preferably glass) and set over the saucepan. The bowl should not touch the water. Whisk continuously for 3-5 minutes until sugar is completely dissolved. (Make sure the meringue doesn't get too hot, or the egg whites will cook through, and the meringue won't be stiff but lumpy. Remove from saucepan in-between to cool down a bit, if necessary.) The meringue should be warm to the touch. Remove from heat and beat with an electric mixer fitted with a whisk attachment on high speed until shiny, glossy, and stiff peaks form, for about 5-7 minutes. Spread the chocolate ganache on top of the cupcakes. Frost cupcakes and store in an airtight container at room temperature or the fridge for up to 2 days. Sabine, First and Obviously: LOVE the recipe. S’mores is always a guaranteed win, but when you add the extra flair that only you can do–it’s just spectacular! This just popped into my mind about guitar lessons. I once had the chance to learn how to play in a “Guitar for Vets” program, but I was too daunted to show up. However, I don’t know if you have something called “MeetUp.com” in your area. It is where people just kind of get together for anything and everything–that is the best way I can put it. Here is an example for the San Fran area for guitar enthusiasts: https://www.meetup.com/find/?allMeetups=false&keywords=guitar&radius=50&userFreeform=san+francisco&mcName=San+Francisco%2C+California&lat=37.77493&lon=-122.41942&sort=default. If you have a hobby–from knitting to coding–or what you think may be the most far-flung hobby out there, I bet someone else already formed a group for it on this website. I’m glad you love the recipe, Amanda! Unfortunately, we don’t have such groups here in Austria. It’s so much easier to find like-minded people and connect with others in the states. One of the million reasons why I love it so much! Guitar for Vets sounds kind of fun. Are you a vet, Amanda? Thank you so much for the link, we will definitely check this out when we are in SF. Hi Sabine. 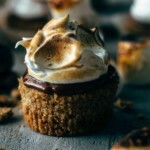 I came across your recipe the other day while searching for the ‘best s’mores cupcake recipe’. There is a baker here in Houston that we ordered s’mores cupcakes from and they were so good that I had to go home and make my own. First off, your recipe looks delicious! Unfortunately I only had enough time tonight to make the cupcakes. Tomorrow I will make the marshmallow meringue. If you have any tips on how to neatly cover the cupcake in ganache and then the frosting, let me know! Hi Monica, I recommend to spread the ganache on top of the baked cupcakes and wait for a few minutes until it dries. Then spread or pipe the meringue on top. You rated this recipe with three stars, but I can’t find anything in your comments what the reason is for that. Could you give me feedback on what you didn’t like about this recipe? This would help me to figure out where people struggled or didn’t like about my recipes. Thank you! I finished the cupcake recipe over the weekend and they turned out delicious! I initially gave it a 3 star review before I finished so it really wasnt a fair assessment. Now that I’m done I’d like to bump it up to 4 stars! The taste was outstanding but I had some construction issues. I covered the cupcakes with ganache and let them dry like you suggested. Then I piped the meringue on top and blow torched it. I ate one immediately afterwards and the cupcake fell apart on me. The cupcake wasn’t dense so it didnt hold its shape. As soon as I peeled the liner off and stuck my fork in it, the whole thing deflated. I popped the rest of them in the fridge to “set” but in the morning they were the same. My daughter requested that I make the graham cracker crust sweeter by using Nabisco honey graham crackers and to make the crust thicker next time. Other than that, it was delicious…just hard to eat. Thank you so much for your feedback! It sounds like there was too much flour in the cupcakes or they were too dry. If you bake with cups rather than a kitchen scale, please make sure that you spoon and level the flour into the measuring cup. Or they were too long baked. An oven thermometer helps to reach the requested temperature. But I’m happy that you liked the taste!